​The European Union of Women (EUW) held their 32nd Council meeting in Prague at the weekend. The delegates from 13 different countries across Europe met to elect their new President and Board. The new President, Margaret Hales MBE, committed the organisation to an action packed future. "We have resolved today to condemn terrorism and all who assist or fund terrorist attacks against ordinary law abiding citizens. We work to make recommendations on the situation of refugees and migrants remembering that they too are human beings. We reach out in friendship to our sisters in other European countries that are striving to reach democracy. Our principles are peace and justice and we must never forget that." Margaret Hales MBE is British but has lived in Spain for 11 years. She reminded the Council that EUW, now in its 64th year, was older that the European Union and includes countries outside the EU. After Brexit the British Section would still have a full and active role in the EUW. Margaret Hales takes over the Presidency from Elisabeth Morin-Chartier, a French MEP, and she will be supported by Dr Margaret Stockham Turner as General Secretary. EUW was founded in 1953 by the Austrian MP Lola Solar and is an NGO with observer status at the UN, OECD and Council of Europe. It welcomes women from the centre right of the political spectrum. Seventeen countries are currently members. ​The 2015/2016 Gazette has just been published. Read it online. 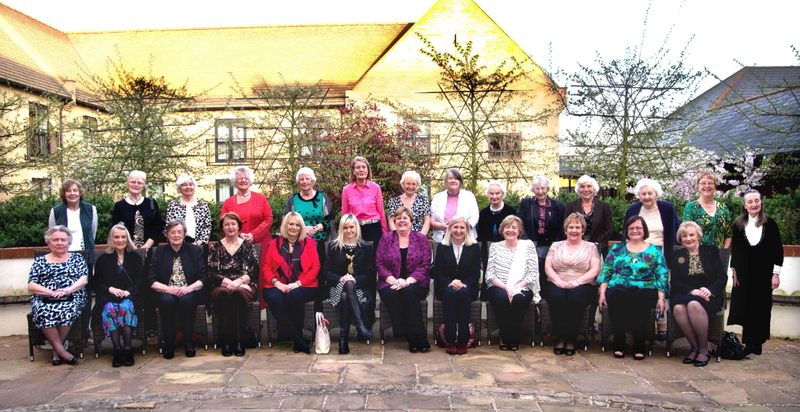 In the beautiful grounds of a Bicester hotel, more than 30 leading women gathered together over two days in April to discuss the future strategy of their organisation. The Council meeting and annual policy forum met to consider the necessary strategies to bring the organisation up to date in the modern world of social media. The Chairman of the British Section of EUW, Dr Margaret Stockham Turner, said: "Our organisation was formed by an Austrian doctor some 60 years ago, in the aftermath of World War II, for women on the centre right of politics. The need for women to network and lobby for improvements is just as necessary for us today as it was in 1953." Guest speaker, The Lord Lieutenant of Bedfordshire, Helen Nellis created great interest. The first female Lord Lieutenant ever in Bedfordshire, Mrs Nellis recognised the work that EUW had done to encourage women to put themselves forward for positions in public life. The second guest speaker was Marta Andreasen MEP, a budget specialist sitting on the Budget Control Committee of the European Parliament. This was most pertinent as Europe recovers from a long period of austerity which has particularly affected women and their families. Bicester Mayor, Cllr Melanie Magee spoke of her work encouraging girls to 'reach for the skies'. Margaret Stockham Turner said "It is pleasantly gratifying that so many mayors are women. There is great enthusiasm for networking and supporting women in public life, for gathering together new ideas and reaching out and encouraging other women to join us."